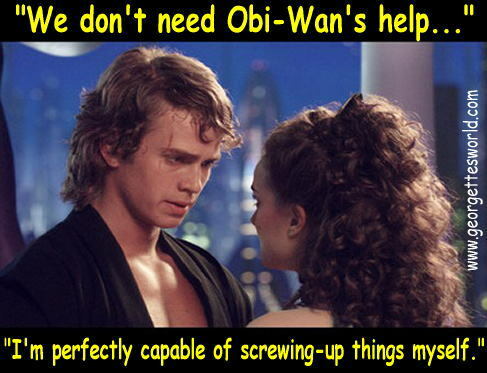 ROTS - don't need Obi-Wan (joke). Another joke from Georgette's World, a joke news website about bintang Wars. Wallpaper and background images in the bintang Wars: Revenge of the Sith club tagged: revenge of the sith star wars anakin skywalker. This bintang Wars: Revenge of the Sith fan art contains anime, komik, manga, and kartun. There might also be koran, kertas, majalah, tabloid, kain, rag, potret, headshot, and closeup. Another funny one! Thanks for posting it. I've been pretty sick this week with asthma and went to the doctor yesterday and this made me laugh. Georgettes World is a riot to visit. I recommend anyone who likes Star Wars to visit her site. It will make you laugh if you're feeling bad like I have this week. If you think about it is sort of true.